They are closely related. The serial numbers may be adjacent. Made in December 2015. I have a great funnel, no mess, thanks KK! No buyers regret. The Robur is just big enough for home use and light at 62 pounds. Seriously it is weird that it works so well and is so easy to live with for home use. I sold the Kony to someone on CS and he loves it too. The compensation with these grinders is impeccable grind quality and they will last forever....well more or less. Thanks. Very happy with it. KK gave me his funnel which means wastage is less than any other grinder I have owned. It is quick and quiet. The Wega Mini Nova Classic seems to be a well kept secret. Rotary and plumbed in. Thanks Paul. The grinder was too good a deal to resist. The Wega I have had for well over a year and works perfectly. Nice simple HX machine. Both look great. Both will still look just as good in ten years. I’ve never even considered it really. An espresso machine produces some steam but steam rises and dissipates quickly. 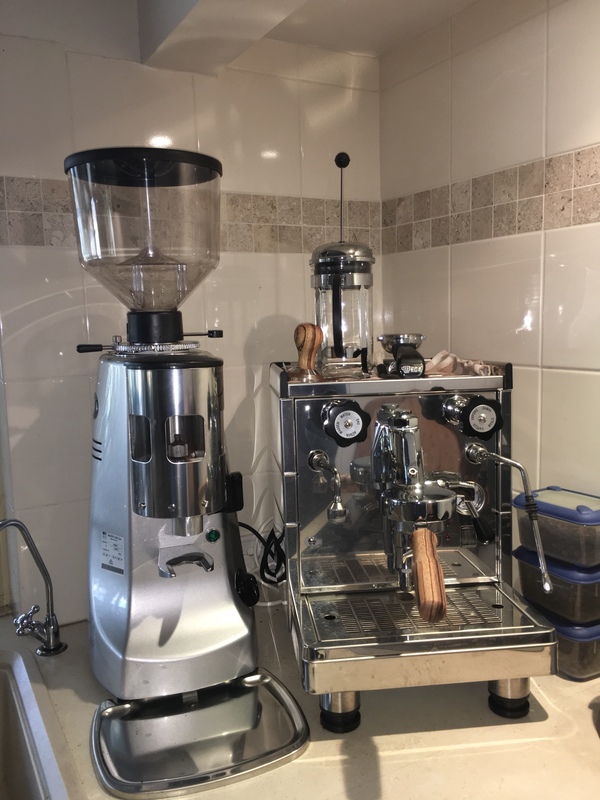 The steam wand is on the opposite side from the grinder in my setup but I doubt if it would matter. Do you want me to make you a custom funnel piece? Oh mate, id love that... thank you! Ahh NICE Brett, congrats! Looks awesome, enjoy!! Lol... I know right but I went and had a play with one at the local cafe and it’s too glorious in every respect. I was going to go all-out and get the electronica but keeping it fresh and efficient would be a challenge at home. I may yet remove the auto-stop assembly from the Robur for chute-sweeping but at this stage I’m happy to waste a few beans. Love your Strega KK. It’s not stuck under cupboards anymore I see. Excellent!! Ah right, I could’ve sworn you shared a YouTube clip on here a few years ago about the Strega that talked about placement in a small kitchen under cupboards. I must be getting it confused with something else.